CÀ MAU — Twenty years later, to the day, the pain is still fresh and the tears flow easily. An old woman said her family “almost went mad” desperately looking everywhere on the sea to find the bodies of their loved ones. 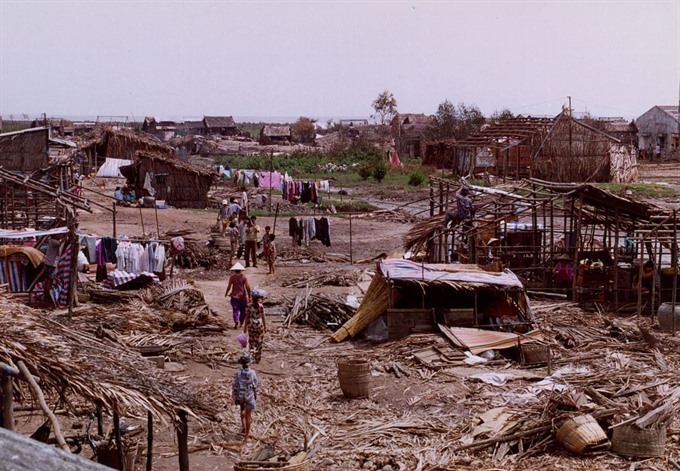 The resident of Village 4 in Khánh Hội District, Ca Mau Province, was one of hundreds of thousands of people who’ve had to suffer the unbearable pain of losing loved ones and property to storm Linda, which struck on November 2, 1997. People in the affected areas remember that the month was a terrible time, with the sounds of mourning emanating from every house. Trần Thị Lăng, a 57-year-old resident of Village 7, also in Khánh Hội District, lost her husband to the storm. Shortly after receiving notice of her husband’s death, she also heard her son’s body had been found, but it turned out to be the wrong person and he came back a week later. “He made it through the storm, however, he was so shaken by the experience that he didn’t want to go fishing for five or six years after,” Lăng said. 20 years ago, on November 2 1997, tropical storm Linda made landfall in several southern provinces and left a long trail of destruction. It was one of the deadliest storms ever to hit the country, with more than 3000 people dead or missing in its wake. The southernmost province in the country, Cà Mau, which bore the brunt of Linda’s wrath, will hold a memorial for the people who perished in the disaster. In just one commune, Khánh Hội in U Minh District, 500 fishermen lost their lives. The Khánh Hội Estuary is a valuable economic asset and its fishing grounds are a source of livelihoods for hundreds of households. Elders in the area said life here has been a constant struggle for long, but in their memory, the area had never been hit by a heavy storm. There was no concept of coping mechanisms or disaster preparedness on the scale needed. They were totally unprepared and everyone was helpless when the storm hit. And the aftermath was as bad, if not worse. Once the storm was spent, the bodies of fishermen started to wash ashore on Khánh Hội’s beach. A pregnant mother in Village 7 waited for days and eventually gave birth while pining for her missing husband. She named her son Trần Hận Biển, literally meaning ‘loathing the sea,’ but ironically, he has remained in the poor fishing village and made his life at sea, like generations of fishermen before him. As many people mourned the dead, some fishermen’s wives refused to believe their husbands were dead, and were determined at all costs to reunite. Trần Thị Đào, of Village 3, vividly remembers the day the storm hit. Having to take care of her children, Đào could do nothing but wait, gazing intently in the direction where her husband and other fishermen were supposed to be fishing, hoping against hope for a miracle. As it poured heavily on November 2, her husband had called and told her that his boat was making its way home, but slowed down by big waves. Shortly after that radio call, communication went dead. That night, many women in Khánh Hội District had a sleepless night. “The next day, it was still raining heavily and sea was still very rough. I sent my three children to my mother’s home and readied a boat to look for my husband,” Đào said. “Others tried to dissuade me, saying there was just no way he could be found in this weather, or that I would just die along with my husband. But I did not listen,” she said. The waterway police stationed at the estuary initially didn’t allow her to venture into the rough seas, but Đào was insistent and wrote a letter saying that she would solely responsible for whatever happened. For four days in the stormy waters, every time she spotted a body floating on the waves, Đào prayed that it was not her husband. On that journey, Đào saved the lives of 18 fishermen. When she returned, she was shocked to see that her house had collapsed in the heavy rain and strong winds. Months later, there was still no sign of her husband, but she kept waiting. With the help of her neighbours, she rebuilt her house and did her best to raise her children. She also saved up to buy a small boat to go looking for her husband again. Lê Thị Mỹ Dung, 43, is also holding on to the forlorn hope, because her husband is still listed as missing. The persistence of women like Đào and Dung has seen a ‘husbandless neighbourhood’ sprouted in Khánh Hội village. Here, women don the breadwinner role and perform other duties usually done by men, like fixing roofs and repairing electrical lines. At a conference held late last month by the Steering Committee for Natural Disaster Prevention and Control to review the Lindas impacts and lessons learnt, former head its dam and storm department, Lê Huy Ngọ, underlined the trauma of human losses in a place that had “never experienced a storm. “Some were even excited to go out and see what a storm looks like,” he said. Apparently, this mindset was also shared by the local authorities. The belief that nothing drastically bad would happen led to inaction and a complete lack of preparedness, and ultimately, heart-rending devastation. When Ngọ reached the province, the fishing boats and ships remained untethered and there were no efforts to strengthen a house’s defences, because locals had no experience dealing with a major storm. He also said that after this costly lesson, the mindset of both locals and the local government changed, and they take storm preparations very seriously. Now, all the sea-bound ships are required to have telecommunication devices installed and fully operational, ready to receive weather warnings at any time. For many, the storm leaves an eternal ache in their hearts. Võ Minh Hoàng, a fisherman, has never met his father. “I love my mother so much. She didn’t remarry. She stayed single and tried her best to raise me. After returning from every trip, she would hold me in her arms and say that I always reminded her of my father, a man I still cannot imagine even though she has told me many stories about her. Typhoon Linda left 778 people dead, 2,123 missing and 1,232 injured. 2,897 fishing vessels sank, another 1,856 sustained damages, and 316 remain unaccounted for. As many as 107,892 houses collapsed and 204,564 houses were damaged. Total economic losses caused by the storm was estimated at VNĐ7.2 trillion (US$ 317 million). Today, Cà Mau Province will hold memorials for victims of storm Linda in Khánh Hội Commune, Sông Đốc Town (Trần Văn Thời District), and Cái Đôi Vàm Town (Phú Tân District). Late last month, Prime Minister Nguyễn Xuân Phúc conveyed his deepest sympathies to the victims’ families and other survivors in a letter marking the 20th anniversary of the storm. He urged greater vigilance and proactive preparedness in the face of increasing frequency and intensity of natural disasters wrought by climate change.